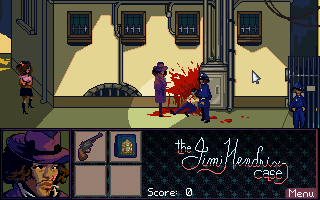 Enter the world of Jimi Hendrix, police detective. 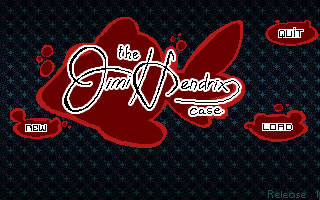 In a world where everyone is Jimi Hendrix, only Jimi Hendrix can piece together clues and find who killed Jimi Hendrix. Created for MAGS July, 2015.
there would have been some warning that you could die, so I would have known to save. I'm playing it and I'm loving it so far. Music and gfx are excellent, abd also the mechanics. I appreaciated a lot the double click thingie and how you polished it. Really a great job. I'll write more once I'll finish it. Started playing. Very nice this far. Love the mode and the craziness of an all Jimi cast. oooh!!! lovely art! downloading now!!! OK, finished. Nice mode. More violence than I'd expected. Glad for saving at a strategic point. I have the fish scales. I've been to the morgue to see the body. Now what? Examine the body better. Then he tells you if there's anything at the crime scene to show him. So show him the scales. Oh my gosh I loved this so much! Amazingly fun idea, great aesthetic and the gameplay really worked well (although maybe people would prefer to have autosaves before death bits, though it didn't bother me in a game this short). Well, that certainly was a true Jimi Hendrix experience. Surprisingly, it never got confusing, I could always tell whether I need to talk to Jimi or Jimi. A good all-around game, very enjoyable. As AprilSkies said, it's very well polished, I always love those little things like double-click to move faster or space for hotspots. The shooting part was kind of tricky on my touchpad, but totally doable. Damn, how'd you get so many points? Is there a max score? Thanks, got it! Great game. You can never have enough of Jimi Hendrix! Cool Game! @Hobo: No idea about the max score, but you get a lot of points for correctly answering all the questions inbetween. Thank you to everyone who's tried the game. I'm so glad so many people are enjoying it. It's been so amazing to watch that little download counter go up and read all of the comments here. I know I should've replied here sooner, but MAGS really took it out of both of us. We've just been resting and recuperating. 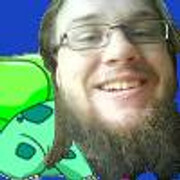 @Bulbapuck: I love your let's plays and I've been watching them for a while. It was surreal to see my own game popping up there. Great to see you didn't get stuck for long and the game played out mostly as expected. I think you should definitely make let's playing the MAGS entries a tradition. @CassieBSG, chaosgodkarl, Bulbapuck, ThreeOhFour and probably others: The sudden death was supposed to be playful, but it might have been a tad extreme. We'll be working on a second release which will address this and some other issues that have been found. The current plan is to replace "Restart" with "Retry" and have it roll things back to a safe point for you. @AprilSkies: Same goes for the missing portraits. We'll be working on that. @Stupot+: We have heard that before! Not sure if we can make it more trackpad accessible. I hope it wasn't much of a hassle for you. @Grok: I was very impressed with your game too! Well, I liked the wishing well and its various outcomes. Some of those puzzles were tough -- required some pretty lateral thinking. @shaun9991: I'll pass it on to CatPunter or CatPunter might post in this thread. @sthomannch: Thanks for playing the game. It's really encouraging reading comments like yours. @AndyfromVA: Glad you worked it out in the end! @Hobo and AprilSkies: I worked so hard on those little bits. I'm so glad you noticed the polish! Still, it was so rushed that I missed marking one of the exit regions with an arrow cursor, so there's that to fix up. Shooting the windows at the crime scene? Shooting the windows in the police station? 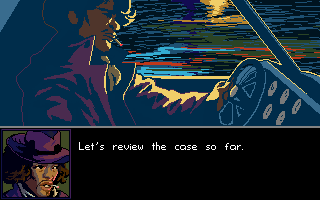 Shooting one of the henchmen at the crime scene for a second time? Shooting the police chief's desk lamp? BSP currently holds the record, as far as I know, with 1480 points. Damn, now I need to play it one more time. Looking forward to the polished version. During the first shooting scene and possibly others, using your police badge on the shooters allows you to freely move around the scene. Also I think the retry option would be best.